You can read the rest of the article on the AARP’s website, or check out the video below for five key strategies to make the situation work. I recorded this video way back in 2009, so the audio is not the best, but it’s worth bearing with it for the important information. This entry was posted in Media appearances, Planning strategies on May 16, 2016 by Christina Newberry. 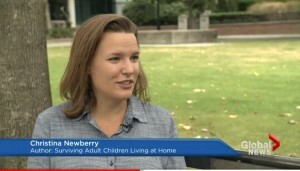 I spoke with Global BC reporter Rumina Daya today about a new CIBC report that shows one in four parents are spending more than $500 a month to help their adult children cover expenses such as rent, groceries and cell phone bills, and that the most common form of financial support parents provide for their adult kids is free room and board at home (71 per cent). You can see Rumina’s story on Global’s website here. This entry was posted in Media appearances on September 3, 2015 by Christina Newberry. Even a modest amount of cash paid to parents every month carries a benefit beyond the merely financial, Newberry added. This entry was posted in Media appearances on July 20, 2015 by Christina Newberry. What if the adult kids never leave? “A family needs to sit down ahead of time and work out a budget … look at what their existing costs are in terms of paying for their home and things like heat, electricity, insurance and food, then estimate how those costs will be impacted by having another person living at home. Read the rest of the article on the Globe and Mail’s website. This entry was posted in Media appearances, News on July 2, 2015 by Christina Newberry. New information from Statistics Canada shows that the number of Canadian seniors in declaring bankruptcy is climbing. More than 82,000 people declared bankruptcy in Canada in 2014, 10% of them seniors. That’s a substantial increase from 8.3% in 2010. Even more worrisome, Scott Hannah of the Credit Counselling Society told CBC Radio’s BC Almanac that the proportion of seniors among the society’s clients has increased from one in 20 fifteen years ago to one in five today. He told host Gloria Macarenko that boomerang kids are a factor in seniors’ increasing debt problems when the adult children don’t pay their fair share of the living expenses. This entry was posted in News, Statistics on June 30, 2015 by Christina Newberry. Delaying adulthood, changing the brain? You can read (or listen to) the whole interview with Dr. Luna, from CBC’s Day Six program, here. This entry was posted in News on March 1, 2015 by Christina Newberry.